A world leader in the development of affordable Solar PV solutions, Phelan Energy Group Limited (PEG), has made global headlines this week by winning a contract to develop a 50MWac solar power plant in Rajasthan, India. This sets a new benchmark in the development of clean, renewable power and falls in line with the Indian Prime Minister, Narendra Modi’s vision of “clean power for all”. Prime Minister Modi’s website celebrating the historic moment. 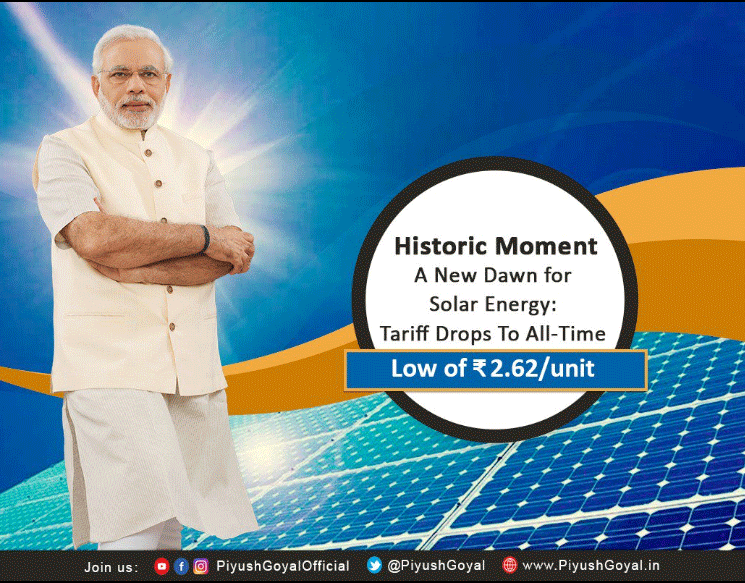 PEG’s bid of Rs2.62 per kWh (ca 4 USD cents per kWh) sets a new record low solar tariff in India, more than 15% lower than previous Indian record achieved in April 2017. According to energy experts and current market conditions, the price achieved by PEG is lower than the average rate of power generated by the coal-fuelled projects of India’s largest power generation utility, NTPC Ltd, at Rs3.20 per unit. 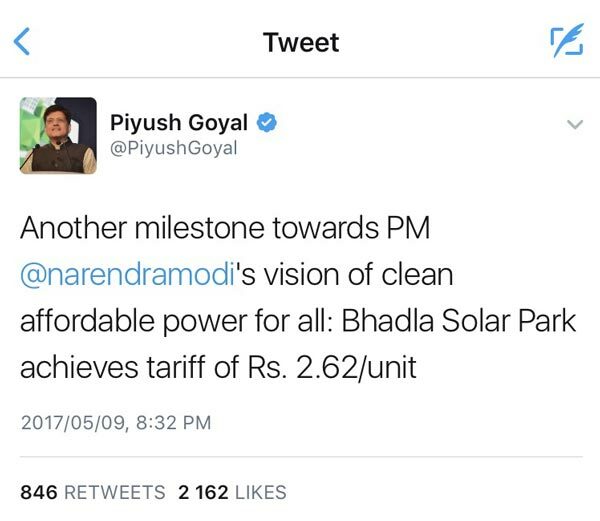 Tweet by India’s Minister of Energy Piyush Goyal. The Indian government has one of the largest solar programmes in the world, with a plan for over 100 GW in the next 5 years. PEG, the developer of the largest solar farm in Southern Africa, with 175MWp, won the online reverse auction in India where 14 pre-selected international solar companies duelled for over 10 hours. “The coal and nuclear industries will fight to hold the old order with non-moving solar cells able to convert sunshine directly into electricity at half the price with minimal environmental impact,” Phelan adds. Phelan Energy Group Limited, ‘PEG’ is a world leader in the development of Solar PV solutions, powering a new generation of affordable solar electricity. Based in Cape Town, South Africa, PEG has built up a highly competitive local and international proficiency in renewable energy. Its subsidiary Solar Capital is the leading solar PV developer in South Africa with the largest solar installation in Southern Africa at 175 MW, that is grid connected, and in excess of 2000 MW of farm ready pipeline.